This Baked Egg Sausage Casserole gets an extra boost of flavor from green chiles and a little pepper Jack cheese. Great make-ahead option! I always feel like the laziest blogger when I post any sort of make-ahead egg dish, like this baked egg sausage casserole. Because, really, recipes like these take about 10 minutes of prep time and even less brain power. 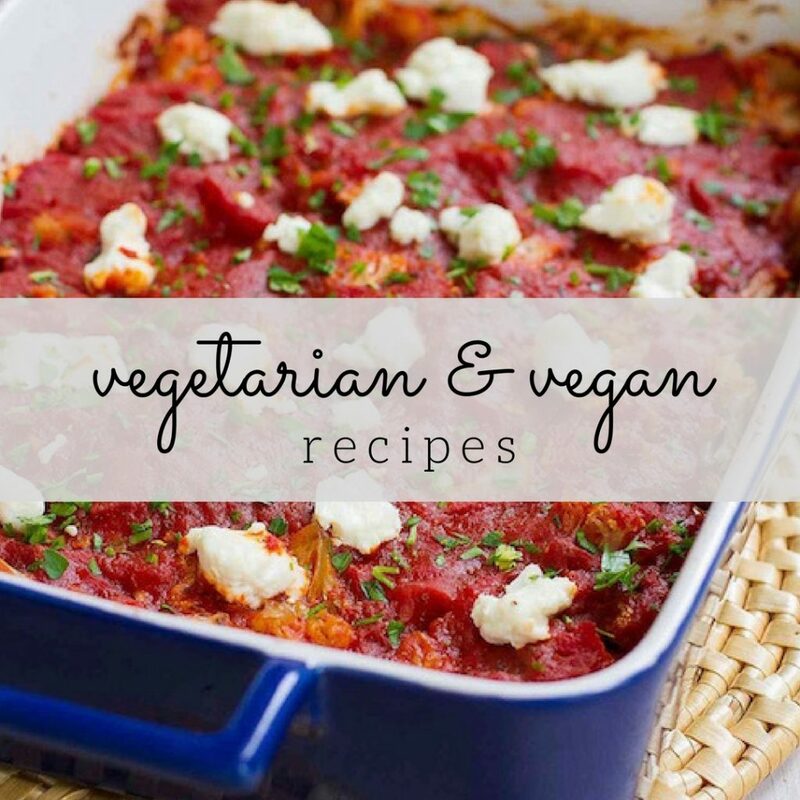 Not to mention the fact that you can combine almost any kind of vegetable, meat and/or cheese and the egg casserole will come out of the oven tasting great! Just ask my boys. Whenever they find out I’m making breakfast for dinner (“Yes, brinner!”), their top requests are inevitably pancakes, waffles and baked eggs. When turkey breakfast sausages are involved, I become even more popular. 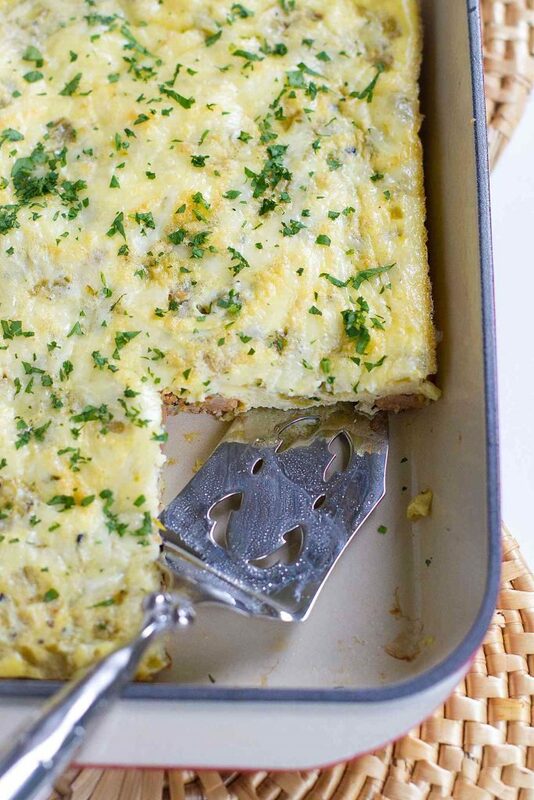 Let’s talk about why baked egg casseroles should be a part of your weekly menus. As I mentioned, egg casseroles require very little hands-on prep time. Chop some veggies, maybe sauté them for a few minutes. Cook some sort of meat, if you like. Grate some cheese. We can all handle that, right? Even on busy weeknights. They can be made ahead! Prepare the veggie/meat/cheese and whisk the eggs the night before, or in the morning if you’ll be serving the casserole for dinner later. When you’re ready to bake it, just combine everything in a casserole dish and slide it into the oven. If you want the ultimate make-ahead option, bake the casserole ahead of time, then reheat each piece in the microwave when ready to eat. Protein! 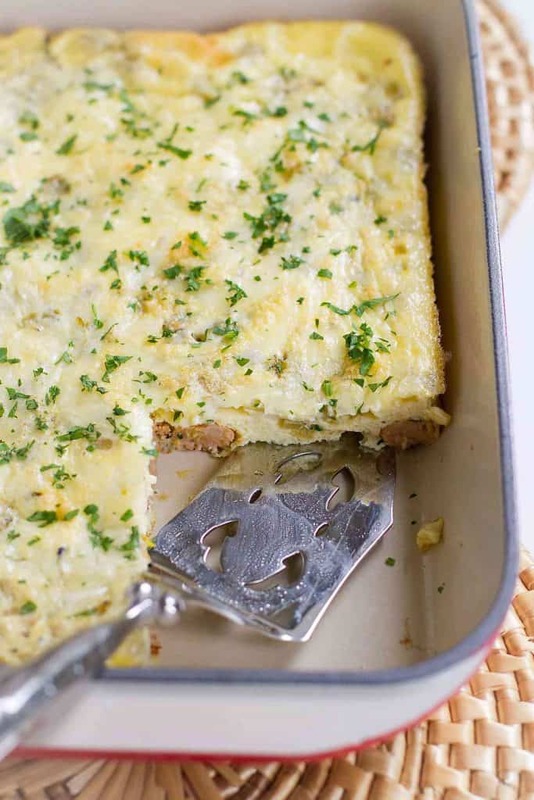 From the eggs to any mix-in lean meat (turkey or chicken sausage, turkey bacon, even chicken), egg casseroles are a great way to start the day with a hit of protein. Veggies! Going along with the #VegItUp challenge, this is another opportunity to add in an extra serving of veggies each day. Mushrooms, broccoli, spinach, onions, red bell peppers…the sky’s the limit. For this baked egg sausage casserole, chop up some turkey or chicken breakfast sausage and sauté until just cooked through. In a casserole dish, combine the sausage with a can of diced green chiles, then pour the whisked eggs and egg whites over top. Sprinkle some cheese on top (I used Pepper Jack) and bake for about 20 minutes. For dinner, we serve the casserole alongside a green salad (trying my best to fill half of my plate with veggies) and some whole wheat toast. Preheat the oven to 375 degrees F. Lightly coat a 7- by 11-inch baking dish with cooking spray. Set a large nonstick skillet over medium-high heat. Lightly coat with cooking spray. Add the breakfast sausage and cook, stirring occasionally, until the sausage is browned and just cooked through. 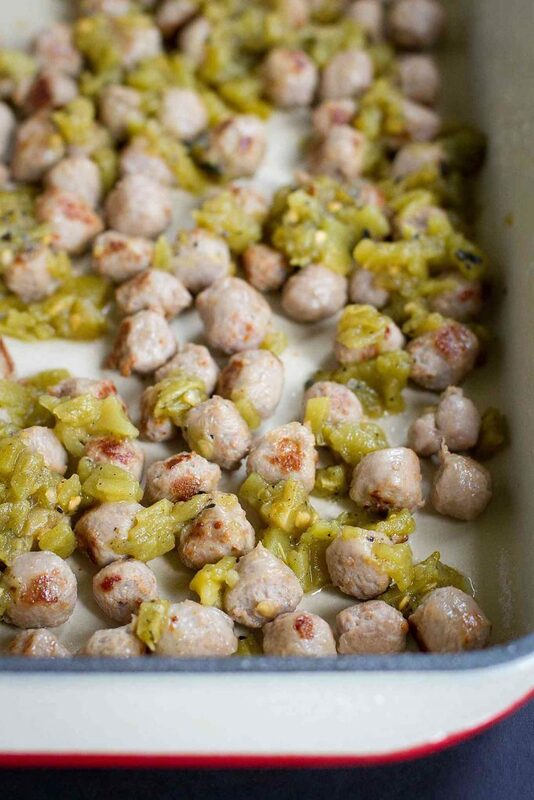 Spread the cooked sausage and green chiles evenly over the bottom of the prepared baking dish. In a large bowl, whisk together the eggs, egg whites, water, salt and pepper. Pour the egg mixture over the sausages. Sprinkle the cheese over top. Baked until the casserole is set and a knife inserted in the center comes out clean, about 20 minutes. Cut into 6 pieces. Serve. Baked egg dishes are probably some of my favorite recipes! I love how simple they are! Between the sausage and pepper jack cheese, I know this is bound to be amazing! This looks like such a flavorful casserole! 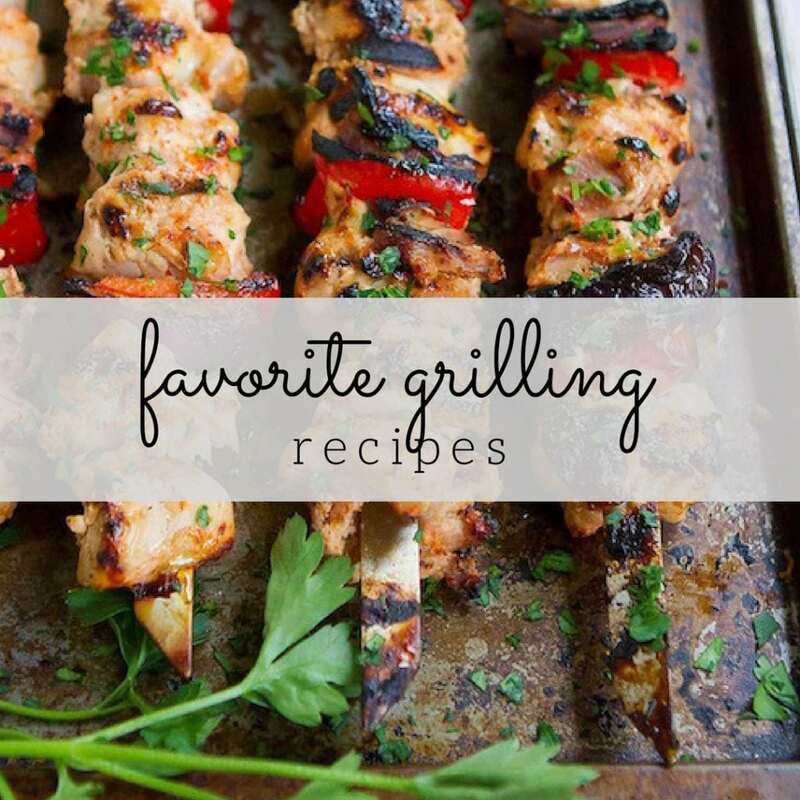 It’s perfect for a weeknight dinner! I just love eggs with chiles. This looks yummy! What an amazing casserole!! I can’t wait to try it!! Great idea, I’d eat it for dinner. 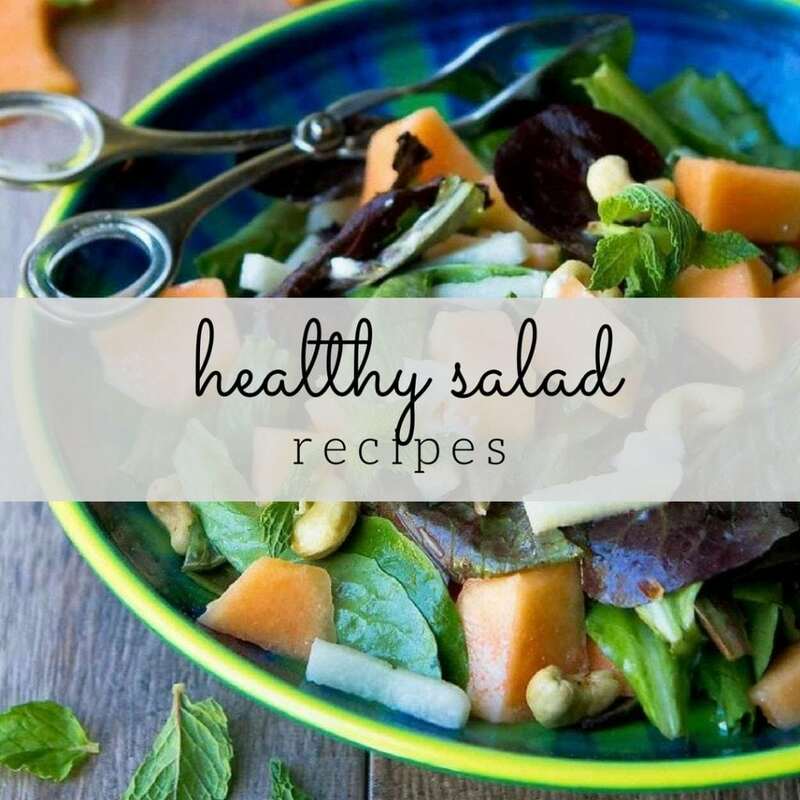 This is perfect for breakfast AND dinner! Can’t wait to try it!